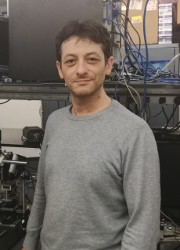 Diego Caraffini graduated in particle physics in 2000, at “Università degli studi di Perugia”, where he also obtained his Ph.D. for a thesis titled “Anti-proton Flux Detection and Indirect Search for Dark Matter with the AMS-02 Experiment.” The thesis used the experiment Monte Carlo production, to study the rejection power for misidentified electrons and protons, that constitute the principal background in the measurement of the antiproton flux. The evaluated level of contamination, was used to assess the experiment capability to identify different Super Symmetric Dark Matter signatures as excess components in the cosmic antiproton flux. During his Ph.D., Dr. Caraffini developed a laser system dedicated to the evaluation “on bench” of the resistance to radiation damage (radiation hardness) of integrated circuits, intended to perform preliminary characterization of alternative components for the experimental apparatus, that was under construction at the time. After obtaining the doctoral degree, Dr. Caraffini sought employment as lead data analyst, in a spin-off company active in the field of radiation hardness qualification and development of radiation sensors, where he contributed to the development of the apparatus and procedure for both the standard test sessions and for project requiring custom configuration and data treatment. In 2014 he joined INRS research group in nonlinear optics. Alpat, R. Battiston, M. Bizzarri, S. Blasko, D. Caraffini, L. Dimasso, G. Esposito, L. Farnesini, M. Ionica, M. Menichelli, A. Papi, G. Pontetti, and V. Postolache. A pulsed nanosecond IR laser diode system to automatically test the Single Event Effects in the laboratory. Nuclear Instruments & Methods in Physics Research Section A – accelerators Spectrometers Detectors and Associated Equipment, 485:183–187, June 2002. B. Alpat, R. Battiston, M. Bizzarri, D. Caraffini, E. Fiori, A. Papi, M. Petasecca, and A. Pontetti. The radiation sensitivity mapping of ICs using an IR pulsed laser system. Microelectronics Reliability, 43:981–984, 2003. B. Alpat, M. Menichelli, D. Caraffini, M. Petasecca, and F. Renzi. Background Estimation in MXGS Apparatus on International Space Station. IEEE Transactions on Nuclear Science, 57:2010–2016, August 2010. E. Fiandrini, G. Esposito, B. Bertucci, B. Alpat, G. Ambrosi, R. Battiston, W. J. Burger, D. Caraffini, C. Cecchi, L. Di Masso, N. Dinu, M. Ionica, R. Ionica, G. Lamanna, M. Pauluzzi, M. Menichelli, and P. Zuccon. Leptons with energy > 200 MeV trapped near the South Atlantic Anomaly. Journal of Geophysical Research (Space Physics), 108:1402, November 2003. E. Fiandrini, G. Esposito, B. Bertucci, B. Alpat, G. Ambrosi, R. Battiston, W. J. Burger, D. Caraffini, L. Di Masso, N. Dinu, M. Ionica, R. Ionica, M. Pauluzzi, M. Menichelli, and P. Zuccon. High-energy protons, electrons, and positrons trapped in Earth’s radiation belts. Space Weather-the International Journal of Research and Applications, 2:9, September 2004. E. Fiandrini, G. Esposito, B. Bertucci, B. Alpat, G. Ambrosi, R. Battiston, W. J. Burger, D. Caraffini, L. Di Masso, N. Dinu, M. Ionica, R. Ionica, M. Pauluzzi, M. Menichelli, and P. Zuccon. Protons with kinetic energy E > 70 MeV trapped in the Earth’s radiation belts. Journal of Geophysical Research (Space Physics), 109(A18):10214, October 2004. M. Ionica, B. Alpat, G. Ambrosi, R. Battiston, B. Bertucci, et al. Absorbed dose rate estimation for protons, leptons and helium observed with AMS01 experiment in low earth orbit during STS-91 mission. Radiat.Prot.Dosim., 116:216–219, 2005. M. Menichelli, B. Alpat, R. Battiston, M. Bizzarri, S. Blasko, J. Burger, D. Caraffini, E. C. Gil, T. Dai, C. Haller, A. Kounine, O. Maris, A. Papi, V. Plyaskine, D. Schartd, R. S. Simon, and M. Steuer. SEE tests for commercial off-the-shelf DSPs to be used in a space experiment. In IEEE Radiation Effects Data Workshop, 2001. M. Menichelli, B. Alpat, A. Papi, R. H. Sorensen, G. A. P. Cirrone, F. Ferrera, P. Figuera, P. Finocchiaro, M. Lattuada, D. Rifuggiato, F. Bizzarri, D. Caraffini, M. Petasecca, F. Renzi, H. Denizli, and O. Amutkan. The Radiation Hardness Assurance Facility at INFN-LNS Catania for the Irradiation of Electronic Components in Air. IEEE Transactions on Nuclear Science, 57:2074–2078, August 2010. M. Petasecca, B. Alpat, G. Ambrosi, M. Menichelli, A. Papi, P. Cirrone, F. Ferrera, P. Figuera, P. Finocchiaro, M. Lattuada, D. Rifuggiato, F. Bizzarri, S. Blasko, D. Caraffini, F. Renzi, and H. Denizli. Wide dynamic range acquisition system for innovative radiation detectors. Nuclear Instruments & Methods in Physics Research Section A-accelerators Spectrometers Detectors and Associated Equipment, 617:296–297, May 2010. P. Zuccon, B. Bertucci, B. Alpat, G. Ambrosi, R. Battiston, G. Battistoni, W. J. Burger, D. Caraffini, C Cecchi, L. Di Masso, N. Dinu, G. Esposito, A. Ferrari, E. Fiandrini, M. Ionica, R. Ionica, G. Lamanna, M. Menichelli, M. Pauluzzi, and P. R. Sala. Atmospheric production of energetic protons, electrons and positrons observed in near Earth orbit. Astroparticle Physics, 20:221–234, 2003. B. Alpat, E. Pilicer, S. Blasko, D. Caraffini, F. Di Capua, V. Postolache, G. Saltanocchi, M. Menichelli, L. Desorgher, M. Durante, R. Pleskac, C. La Tessa. Total and Partial Fragmentation Cross-Section of 500 MeV/nucleon Carbon Ions on Different Target Materials IEEE Transactions on Nuclear Science, 60:4673-4682, 2013.